A spruced-up version of a dirty box mite. 2009 © DEWalter. There is a skirmish going on at Dechronization blog right now1. This is a coauthored blog about phylogenetics. I like used to like this blog (its was right there on my blogroll —->2). There are surprisingly very few blogs about phylogenetic methods these days, despite the wide use that phylogenies currently have in evolutionary biology and beyond (e.g., linguistics). I will complain that, for nine authors, they post little, sometimes not a single post during a month. 1. Update 12:00pm GMT, April 22nd, 2009. Original post on Dechronization deleted. 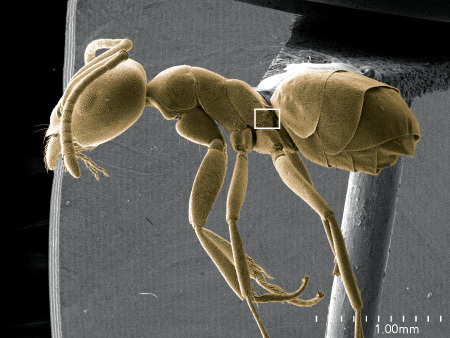 This image shows the mouthparts of a trap-jaw ant in resting position. The only structures really visible are the prominent elongated mandibles (in yellow) that project forward. The rest of the pieces, laying immediately below, are retracted inside the preoral cavity. Thursday, April 16th, 2009 | Nomenclature, Taxonomy | Comments Off on Honeybee or Honey Bee? ScienceBlogs started a new blog with an interesting dynamic, the title of which is either a very clever use of terms or a super-geeky pun, depending on your level of causticity: Photo Synthesis. The metapleural gland is the definitive character of ants. It is unique to the family. 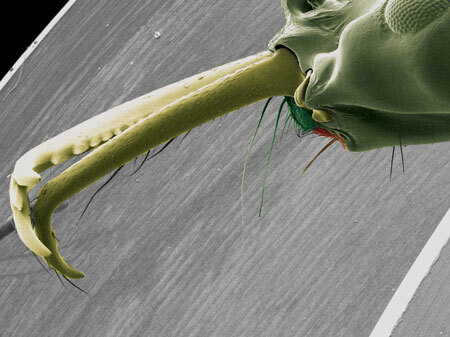 Nothing homologous or similar is found anywhere else in insects. Within the tree of life of Hymenoptera, myrmecologists agree that the appearance of this gland provides a good cutting point to marks-out ants as a monophyletic group1. You have it? You are an ant. You don’t? Sorry, you don’t qualify, get the hell out of here lousy wasp2. It is the ultimate ant synapomorphy. This is an excellent example of the way systematic papers should be. In the latest issue of the Proceedings of the National Academy of Sciences (USA), Blackledge and coworkers assembled a comprehensive data set for cladistic analysis of orb web spiders that includes six different molecular loci, 143 morphological characters and behavior in the form of characters derived from web architecture. At any given position along their DNA sequences, ants may have any of the following four nucleic acid types: A, T, C or G. Unless we are dealing with the mitochondrial genome that is known to have quite a few A+T-rich regions in insects, in which case expect to find just those two types of nucleotides.